We see a lot of self-published books at the store. All are by people passionate about their creations and hopeful they will find a broad audience. But while we would love for these books to sell well, most of them don’t, for a variety of reasons. First of all, it’s hard for ANY book, published by any outfit, to rise to the attention of readers. It takes the right push at the right time for a book to take off, and that is an art, not a science. It’s true for all books; that’s just the reality of publishing and marketing. Self-published books have additional challenges. Sometimes the subject matter has a limited audience. Often, the books suffer from poor production values, not having the advantage of professional design. They might feature text that hasn’t been edited for clunkiness or shaped into a satisfying narrative arc. They might present art that isn’t as professional as that found in books published by traditional houses. And the cost of small press runs usually leads to disproportionately high cover prices. All of this can add up to a hard sell for customers. But every once in a while, we are delighted to see a self-published book like this one. 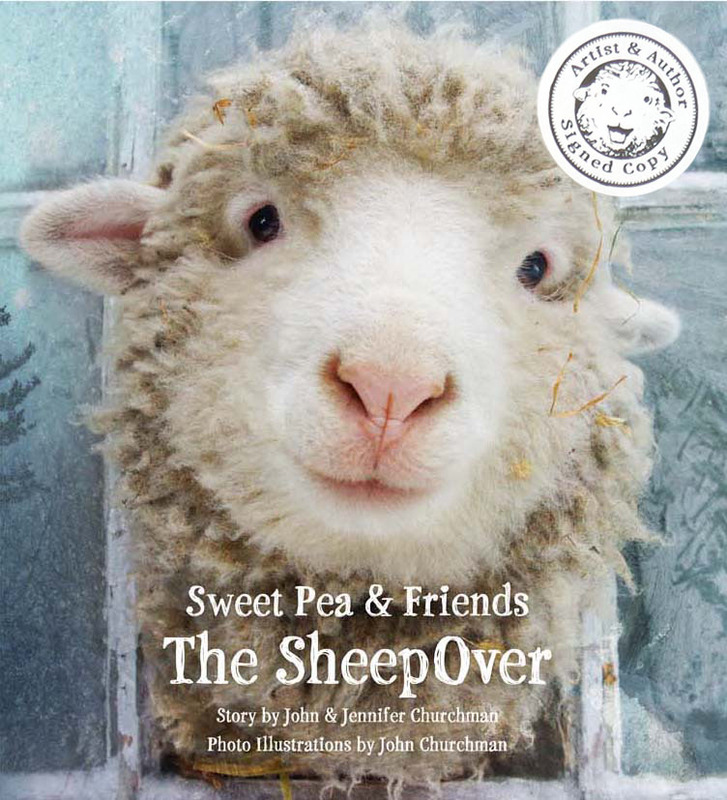 Sweet Pea & Friends: The Sheepover is a beautifully designed, appropriately priced book (full color, $19.95, printed in the United States!) 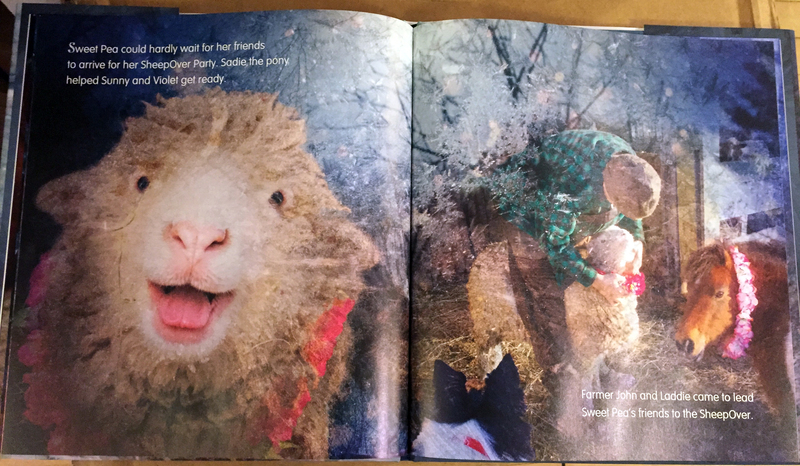 and starring about the sweetest-looking sheep you ever saw. I’d never met John, or heard of his farm, but when he brought in this book for us to consider selling, it was hard not to jump over the counter and pump his hand in congratulations. My fellow booksellers and I marveled over the quality of the book and asked many questions about how it came to be. 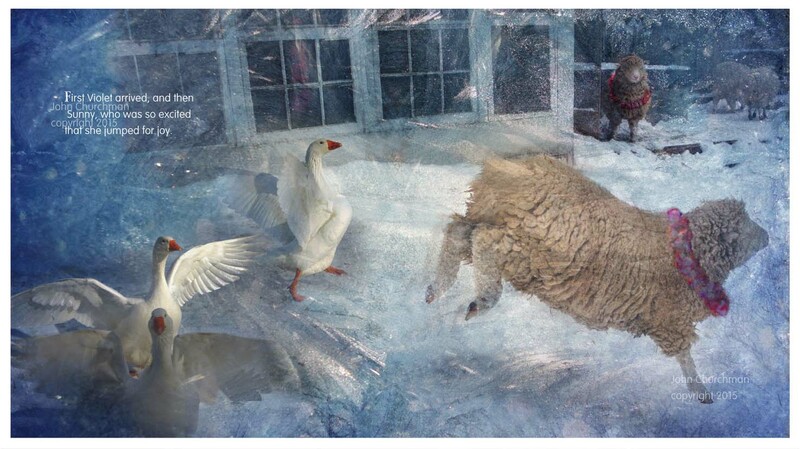 Co-authors John and Jennifer Churchman live on a Vermont farm with a variety of animals. John, a professional photographer, has a good-sized online following, and his family’s blog posts about farm life have also developed a readership. When the Churchmans’ lamb, Sweet Pea, was injured and then saved by their collie, Laddie, their blog readers were hugely invested in the story. 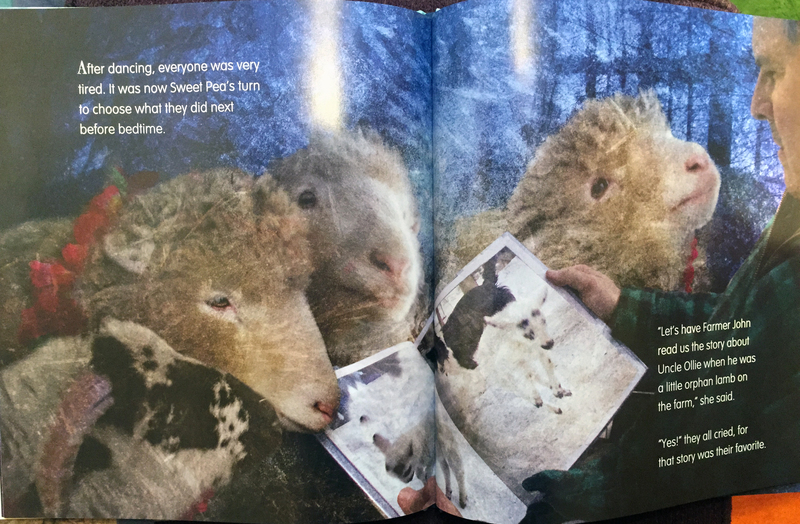 That led to John and Jennifer deciding to turn Sweet Pea’s adventure into a picture book. John had the advantage of many years’ experience working with design, photography, and pre-press preparation. He’s also an artist. 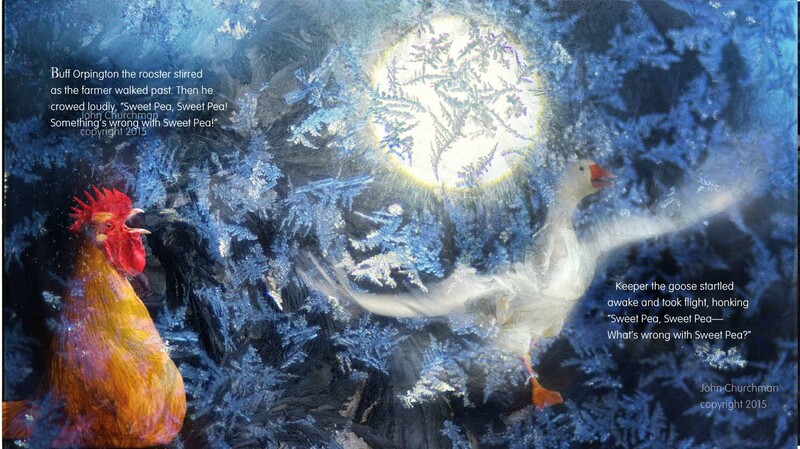 The spreads are lovely. Usually, I find collage static and choppy, but these are fluid and manage to be both friendly and slightly mysterious simultaneously — not a common mix, and an arresting one. 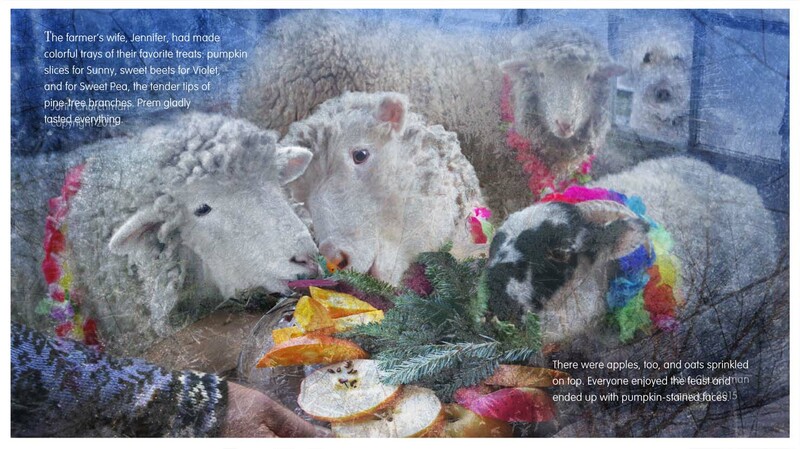 The backgrounds of the photographs are textured with frost patterns John Churchman photographed in his winter barn, and in the party scene, there are beautiful soft color bursts adorning the sheep like so many festive scarves. The story is told in a straightforward, gentle, fun way that suits it. This is a book that sells itself the minute you put it into a customer’s hands. Note: due to a spam attack, the comments section of this blog has been temporarily disabled. We hope to have it up and running soon! This entry was posted in Uncategorized on October 2, 2015 by Elizabeth Bluemle.